Organic nursing pillows are an essential item to have on hand in your baby’s first year. A nursing pillow is designed to help you bring your baby closer to the breast, and to help you nurse in a more comfortable position. And I can attest to that — if there’s one product that saved my back as a new mom, it was my nursing pillow. I used it so much during the early days with both of my boys when I was adjusting to holding a baby 24/7 and learning how to breastfeed. And it was so worth it to get an organic one! I would definitely invest in a nursing pillow. While most nursing pillows are made from polyester, or even polyurethane foam, these organic nursing pillows are made from cotton and other natural materials. Please try to avoid nursing pillows made with polyurethane foam. Even if it is made by a reputable brand, you may not really know whether the foam contains any flame retardant chemicals. And in any case, I try to avoid that in all products where possible and reasonable. Even polyester isn’t ideal, but better than polyurethane foam. Also, beware of mainstream brands offering an “organic” nursing pillow that really only has an organic cotton cover. The main area of concern is the pillow fill, not the outer cover (though we want that to be organic, too). Like most new moms, you’ll probably use your nursing pillow a lot. And you may even use it for tummy time or for other playtime activities. Your baby will make direct and prolonged contact with the pillow, so I would register for one of these organic nursing pillows, and use your completion discount to save 15% if you end up having to buy it for yourself. The MoonWomb by Sustainable Baby Co.
Use your nursing pillow when breastfeeding or bottle-feeding your baby in bed, on the couch, or in your glider. 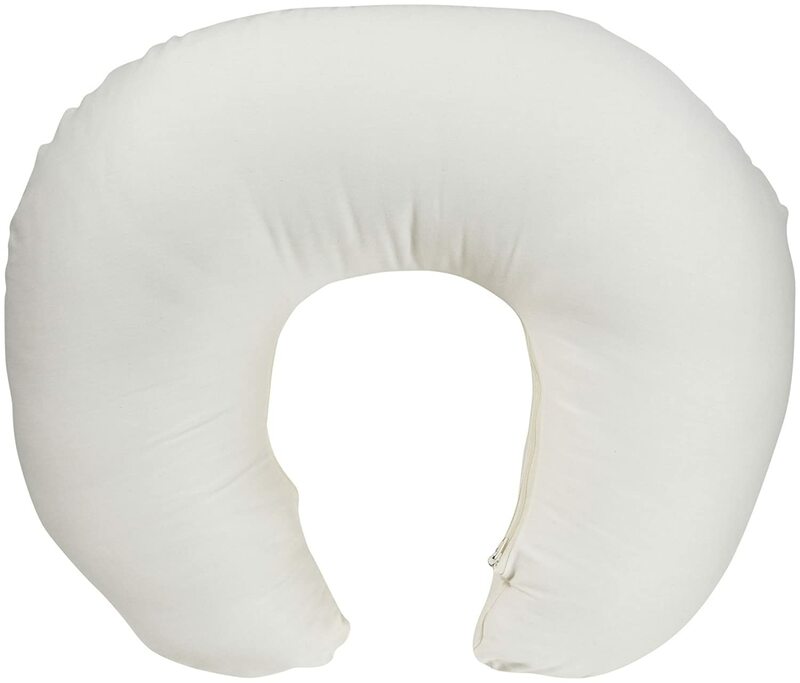 Use the nursing pillow when you want to cradle your baby in your arms but need extra assistance. Use your organic nursing pillow to position your baby for tummy time. 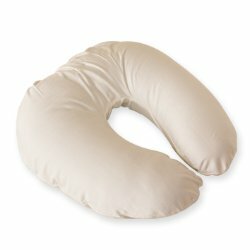 Some nursing pillows can be used as a body pillow during pregnancy. Continue using your nursing pillow to prop up your baby as they grow. Made in USA. The Nesting Pillow was my personal choice for an organic nursing pillow. It is crescent-shaped, which makes it easy to fit your baby on the pillow in your lap. And it is filled with organic buckwheat hulls, which allows you to shift the contents around, much like a beanbag. It comes with a washable slip cover made from 100% organic cotton canvas milled in the US and is all-around wonderful, although a little on the heavy side. Compared to some of the other nursing pillows on this list, the Nesting Pillow isn’t as useful for tummy time and other playtime activities. Dimensions: 26” x 16” x 5” quarter moon-shaped. It weighs 5.5 lbs. Made in USA. 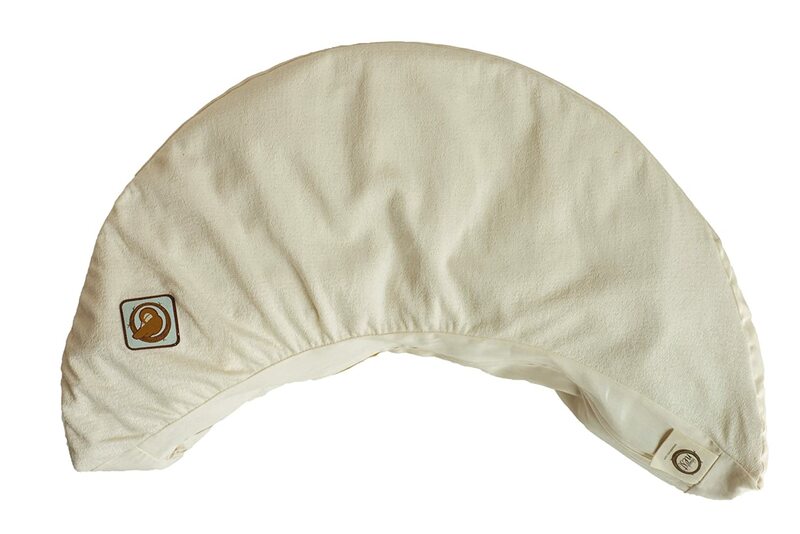 The Holy Lamb Organics Nursing Pillow is another great choice for an organic nursing pillow. This u-shaped pillow is made with an organic cotton cover and eco-wool batting. If you have your heart set on a Boppy but prefer one made with natural materials, this may be the best option for you. It is compatible with Boppy’s organic slip cover. MoonWomb by Sustainable Baby Co.
Made in USA. 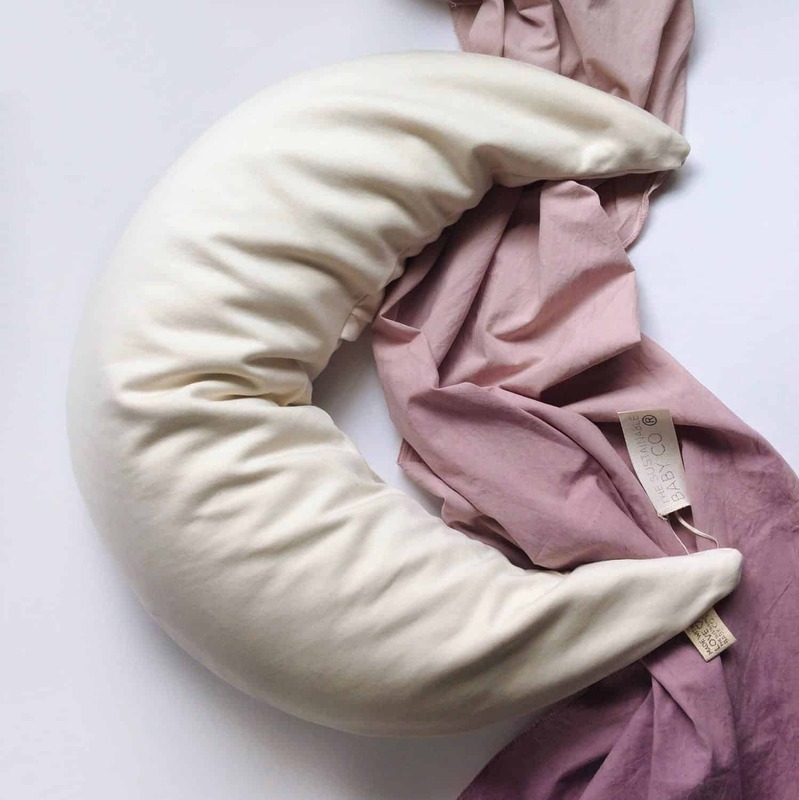 Another crescent-shaped organic nursing pillow, the MoonWomb is made with all organic materials. The pillows are also beautiful, and a nice addition to any nursery. They have numerous different outer fabrics to choose from, so if you’re looking for a stylish organic nursing pillow, this may be the right one for you. It also includes a small pocket with a removable sachet of organic lavender and chamomile flowers, that can help to calm you and your baby. This is probably the only pillow on the list that would nicely double as a pregnancy pillow. I love products that can serve more than one purpose! Made in USA. Made with an organic cotton cover and kapok fill, the Pure Rest Organic Nursing Pillow is also shaped like the popular Boppy nursing pillow. 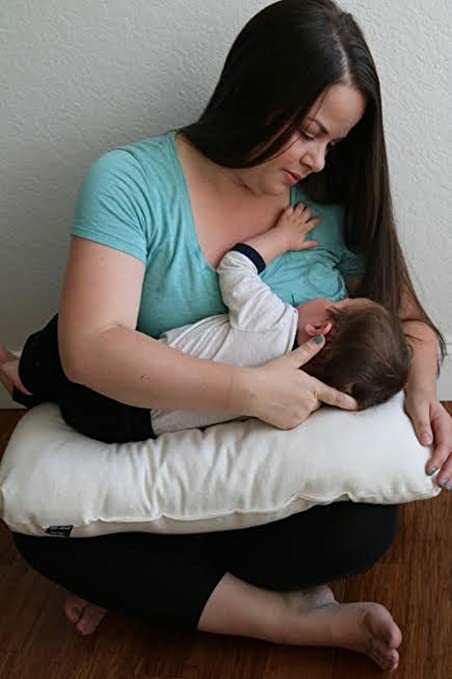 This breastfeeding pillow also fits the organic Boppy slip cover. Made in USA. The Organic Caboose nursing pillow made from 100% certified organic cotton grown in the US. It is a great pillow but may not be as firm as the other options on the list, since it is only filled with cotton.